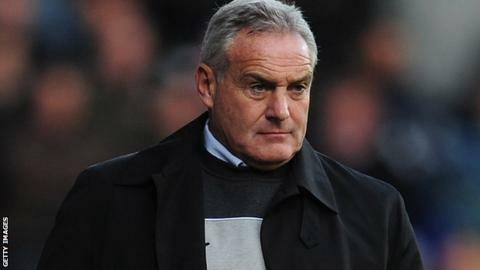 Sheffield Wednesday boss Dave Jones has questioned the sense in sacking him because of the club's current poor run. The Owls lost 4-1 at home to Watford on Tuesday and currently sit 23rd in the second tier. "I haven't become a bad manager overnight. I'm never fearful of my job because I'm good at what I do," Jones told BBC Radio Sheffield. "Go get whoever you want in. Get Mourinho. He'll still be working with the same players." He added: "You could bring someone else in but what happens if it doesn't work for them? You bring someone else in? The club has been through that enough times. "Sometimes you have to hit rock bottom to find out what the good times are. We have to come out fighting. I will and I expect the players to as well." Wednesday have now lost their last five league games and travel to promotion-chasing Cardiff, who sacked Jones in May 2011, on Saturday. Jones believes his players need to take more responsibility on the pitch. "There were too many players who I think hid a little bit but when things aren't going your way you need to be big and brave," he continued. "Our confidence seems to be totally drained - there's a fear factor. The players have a responsibility to be brave and I believe they have it in them. "We're like a wounded animal at the moment. What does a wounded animal do when it's in trouble? It claws its way out. That's what we need to do." Meanwhile, chairman Milan Mandaric is confident the side have enough quality to avoid relegation from the Championship. He told BBC Radio Sheffield: "We will pick up more points and we will not just survive, we will stabilise. "We will put a team together that will give us a good platform to move forward. Now is not a time for panic, now is a time for character. "It took patience and good support for us to get what we wanted but it is a building process and we need everyone to understand we are doing everything humanly possible to make the club successful. We are not overlooking anything. "We need to recognise we have hit a stumbling block and some of the players have not gelled as quickly as we would have liked but that will happen."